Google has been on a mission of late to refine its mobile search with more features being pushed out on the mobile end than the desktop of late. So this should come as no surprise as Google has begun giving AMP pages preference if they meet the criteria for a featured snippet on mobile. The new feature seems to have launched a few days ago where on mobile search they are now likely to serve featured snippets from pages that are powered by AMP. If you're not sure what I mean pull out your smartphone or set your browser to browse as a mobile device and visit Google. 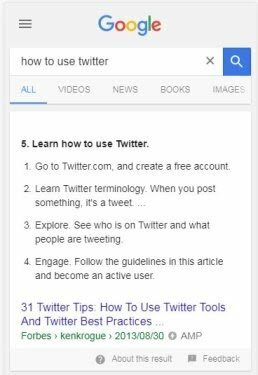 If you search for [how to use Twitter] on Google desktop vs Google mobile, you will get Wired’s non-AMP page for the featured snippet on desktop and Forbes AMP page for mobile results. Some publishers and webmasters are noticing significant changes in their traffic because of this change. It seems, although Google has not confirmed this yet, that Google may prioritize an AMP document in the mobile featured snippets over even mobile-friendly pages that are featured on a desktop. While this is not always the case, as the content is always going to be the deciding factor. Since I was able to bring up results in the featured snippets box on mobile that were not powered by AMP. It does look as if two pages are very close in content and one is AMP and one is not, the AMP page will get the nod most times. Have you noticed this as well? Has your Google traffic for featured snippets changed in the past few days and you're seeing an increase or decrease in traffic? Let us know in the comments section below.